You look down at your arms and legs, willing them to be soft and supple, but all you see is scaly patches and irritated red spots. Let's face it -- dry skin is such a nuisance. And as soon as the temperatures drop, this beauty chick fights against them to maintain some sort of smoothness in her limbs! But no matter how many creams and lotions I've tried, I can never seem to find one that really and truly gets rid of the dryness for good. 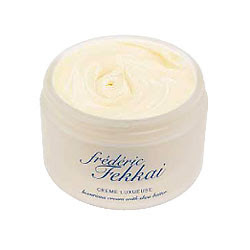 That is, until I tried Frederic Fekkai Creme Luxueuse! The massive, industrial-sized tub contains some of the richest body cream I've ever come across. It's so thick, so intensively moisturizing, so absolutely dripping with nutrients and vitamins, my skin went from embarrassingly dry to fantastically fabulous in a matter of minutes. Seriously! Formulated with shea butter, it really is a miracle worker. My legs especially have always been dry -- whether warm or cold, heat wave or cold front, they just can't seem to be moisturized enough and soak up lotion like it's their job. But now they are so soft and smooth, I'm not embarrassed to be seen wearing skirts with no tights! So why not check out this miracle-worker for yourself and wrap your body in the ultimate luxury?